Chris Zacharias confirmed to AARN last Friday that their will be no first annual American Modified Pavement Series (AMPS) this season. 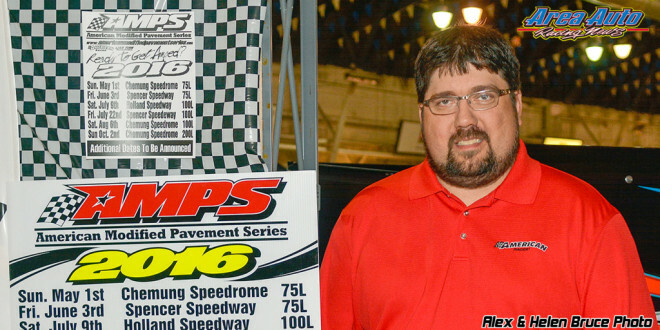 Zacharias announced the formation of the series in AARN’s March 8 edition after a sales dispute became public between former Race of Champions series owner Andrew Harpell and its purchaser Joe Skotnicki. Zacharias, who was named in court documents regarding the RoC dispute, told AARN all charges against him had been thrown out and he’s free to promote AMPS. He’s decided, however, to drop his proposed schedule for asphalt Tour-type Modifieds which would have raced on American Racer tires for at least this racing season. The majority of events on Zacharias’ tentative scheduled released at the Motorsports Expo in Syracuse, N.Y., in early March were at two tracks promoted by John White: N.Y.’s Chemung Speedrome and Spencer Speedway. White’s tracks were on both the RoC and AMPS schedules at one point. White decided to stay with the RoC following a court appearance of the two parties that insured him their would be no injunction stopping its schedule. The RoC asphalt Modified series opened after the court appearance under Skotnicki’s control at Pa.’s Mahoning Valley Speedway. White was to have had his first scheduled event on the RoC series this past Sunday at Chemung, but it was rained out and rescheduled to May 27. Zacharias said he’ll now spend several months putting something together for 2017. Zacharias said AMPS is out, but only for now.